It's a scandalously divided society in which the rich respond to the poor with little more than insults and shrugs. It's a world which pursues profit at the expense of people, a land crippled by social injustice. And David Edgar's new adaptation of Dickens' classic leaves audiences in no doubt over what it has to say about modern Britain. Rachel Kavanaugh directs this fine and elegant production, which does well to avoid sentimental excess and clichéd depictions of cheeky Cockneys. Yet it's also guilty at times of being somewhat unsubtle, stirring our heads more than our hearts: it expounds its noble ideas so explicitly that it leaves little work for the audience to do. What might be more effective shown or suggested is too often told, which makes for a more passive experience than might otherwise be the case. That aside, there is much to commend this two-hour show. Phil Davis makes a tremendous Scrooge: he's as crabby and crotchety as one could wish for, but more important is the sense of a man who above all else is ruled by fear. It's a rich portrayal of a character more often depicted with a cartoon's depth, and makes his redemption all the more plausible. He enables us to see more of ourselves in him than is comfortable, too. His dramatic foil is Gerard Carey's Bob Cratchit, whose generosity of spirit is among the more emotionally affecting aspects of the play; there is a heartbreaking naivety to it. The children do particularly well, too, with Jude Muir suitably winning as a tragic Tim. It's all staged with a delicate touch: this is not the most eye-popping of productions, but there are vast and beautiful animations during Scrooge's scenes with the ghosts, and the shifts from grimy slum to rarefied salon are handled well. But not all the directorial choices work so well: the Ghost of Christmas Past is a rather half-hearted psychotherapist, while the idea of having Dickens himself tell the story worked only intermittently and may prove a little confusing for younger audience members. There are also some bafflingly vogueish character names: we have a Mrs Snapchat, and one of the children is called Tinder, which feels wrong in various respects. This Christmas Carol is at its worst when it's at its cleverest. But the production doesn't get much wrong and gets a lot right. There are no great surprises, but no great disappointments either, and it will give audiences what they're after. 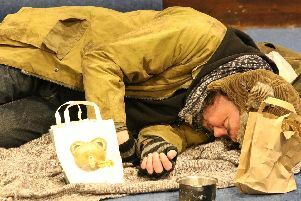 But maybe Dickens would rather we judge it using a different measure: it would be interesting to know, for example, if any of the many people sleeping on Stratford's streets receive more help from theatregoers as a result of this production. I fear they may not, but dearly hope I'm wrong. * A Christmas Carol runs until February 4. Call 01789 403493 to book.